SYDNEY -- Australia will direct more foreign aid to develop the sport of rugby league in the Pacific, officials say, bolstering a soft power offensive against China’s growing influence in the region. The plan, backed by Prime Minister Scott Morrison, aims to tap into a shared passion for the bruising game by funding more coaching clinics and exhibition matches on far-flung Pacific islands being wooed by China. “The prime minister sees rugby league as a central component of his soft-power plan as China’s influence in the Pacific grows,” said a senior rugby league official who declined to be identified as he is not authorized to talk about the plan. Declaring the Pacific “our patch”, Australia is stepping up its diplomatic and trade efforts in the region, uneasy at China’s bid for influence through infrastructure loans and its version of soft power - “ping pong” diplomacy. China’s encouragement has helped table tennis, or ping-pong, gain a foothold in Papua New Guinea (PNG), but it is unlikely to challenge the island’s love affair with league rugby. Such is the region’s passion for the game that when Australia played a friendly match in PNG in 2016, thousands of people lined the streets to catch a glimpse of the visitors. League-obsessed fans also follow their players in Australia, where athletes of Pacific island or Maori descent made up 44 percent of National Rugby League (NRL) rosters in 2017. Australia’s Pacific Outreach Programme, which includes schemes developed along with the NRL, will expand to include smaller but strategically important islands, officials said. “Together with the government we have plans to expand into the Cook Islands, Niue and Vanuatu,” said Frank Puletua, senior manager of international strategy at the NRL. The three island nations have signed up to China’s Belt and Road Initiative, which promotes expanding land and sea links between Asia, Africa and Europe, with billions of dollars for infrastructure development. The NRL already runs programs in Papua New Guinea, Fiji, Tonga and Samoa, all of which have joined Belt and Road. In response to China’s investment push, Australia has promised Pacific neighbors up to A$3 billion ($2.16 billion) in cheap infrastructure loans and grants, but the new fund is not expected to be operational until July. Unable to match China’s deeper pockets and its willingness to fund projects that Australia will not - such as a new road in PNG - Australia has dialled up a playbook that promotes its cultural ties with the region. It expanded a Pacific jobs scheme that allows men and women from several island nations to work in Australia. Morrison, on a tour of the Pacific, also promised to relax curbs on imports of Kava - a mildly intoxicating brew that is deeply embedded in the social fabric of Pacific islanders. 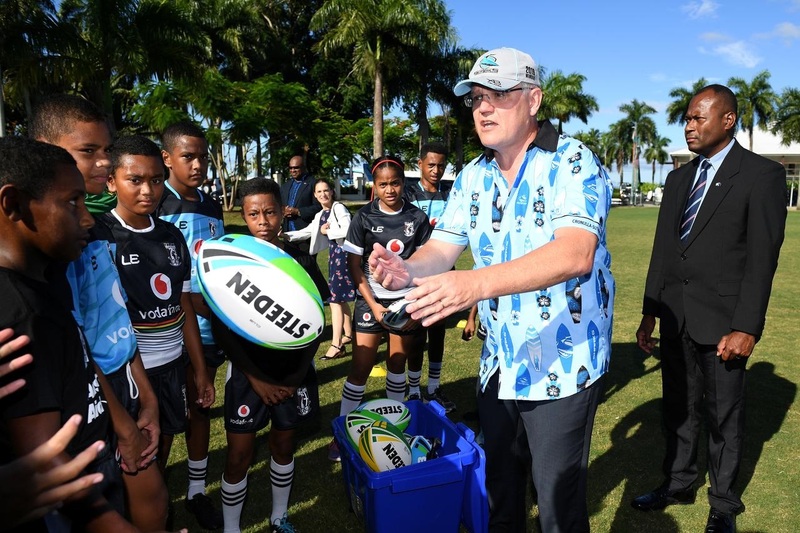 During a trip to Fiji, Morrison said his government would pay the travel costs for a Fijian rugby league team to compete in the second tier of Australia’s national competition, joining a team from PNG that has competed since 2013. The NRL also plans a series of pre-season games in the Pacific region. “One thing we have greatly in common is our passion for sport,” Morrison said in Fiji’s capital Suva.